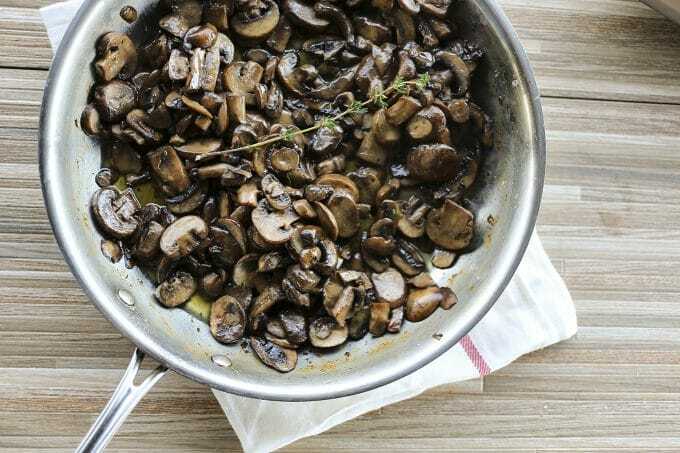 Garlic Butter Sautéed Mushrooms are a study in simplicity; a handful of great ingredients are made even greater in combination with each other and minimal interference. For a mushroom lover, Garlic Butter Sautéed Mushrooms are about as good as it gets. First garlic cloves and fresh thyme are gently poached in butter, infusing it with all of their goodness. Then the mushrooms are gently sautéed in the fragrant garlic and thyme butter yielding tender, umami-packed morsels of Garlic Butter Sautéed Mushrooms. What do you do with a pan full of Garlic Butter Sautéed Mushrooms? They make an admirable side to a steak or any kind of roast be it pork, beef or chicken. They’re also incredible as a topper for polenta, or stirred into pasta with a handful of grated Romano, Parmesan, or Asiago cheese. I, as an admitted fungi fanatic, am perfectly happy to sit down and polish off a bowl of sautéed mushrooms all by themselves. 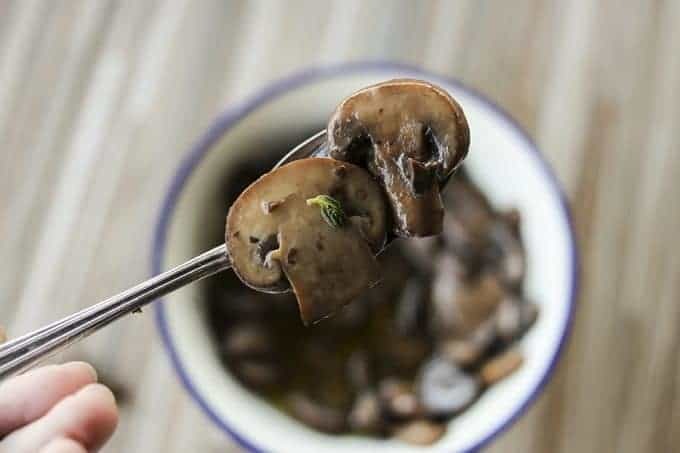 How will you serve Garlic Butter Sautéed Mushrooms? I will always bang the drum for cooking with unsalted butter and this Garlic Butter Sautéed Mushrooms recipe is no exception. That said, it won’t be the end of the world if you start with salted butter, just have a light hand with the salt when sprinkling it over the mushrooms to help avoid an over-salted finished dish. When you fish the garlic and thyme sprigs from the butter, don’t throw them away. They’re full of goodness! 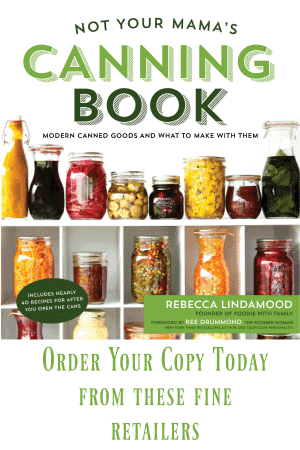 Save them and mash to add to pasta sauces or pan sauces. You’ll be so glad you did. 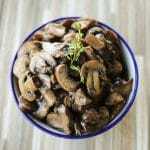 You can use white button mushrooms or criminis -also known as Baby Bellas- here. My preference is for the criminis , but either will do! Unlike when making seared mushrooms, it’s okay to have a few more mushrooms in the pan. You still want to add them in installments, but we’re looking for a more gentle sauté that verges almost on butter poaching, so it is okay to add larger amounts to the pan than if we were searing them. Garlic Butter Sautéed Mushrooms are best when eaten within 4 days of being made. 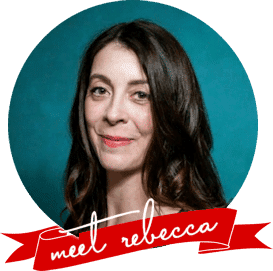 If you plan to keep them longer than that, freeze them with the garlic butter and pan juices in an airtight container or zipper top bag for up to 3 months. 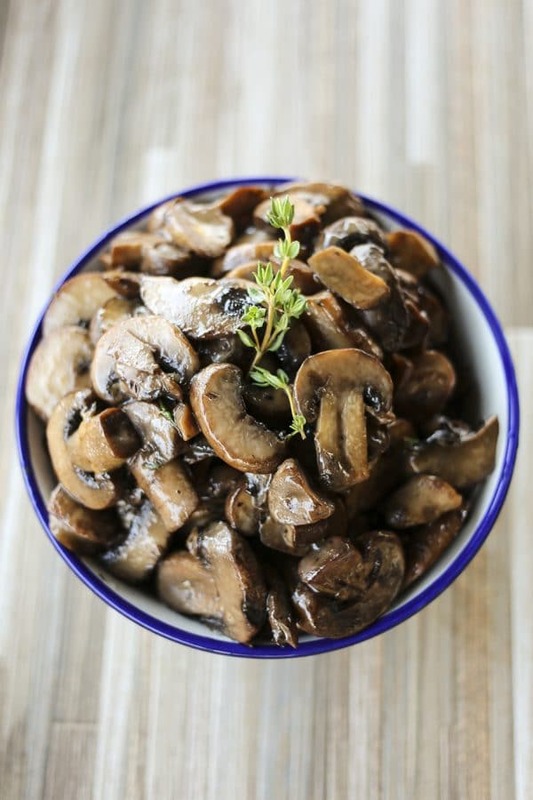 Look how easy these Sautéed Mushrooms are to make! Savoury, tender, umami-packed morsels of Garlic Butter Sautéed Mushrooms make a great side dish for roasts and steaks, or topper for polenta or noodles. Melt the butter in a high-sided sauté pan over medium low heat. Add the garlic and thyme, drop the heat to low, and cook for about 10 minutes, or until the butter is fragrant and clarified, and the garlic is is tender, swirling frequently. Use tongs or a fork to transfer the garlic cloves and thyme sprigs to a bowl. Raise the heat to high and add about 1/3 of the mushrooms to the pan. Sprinkle a couple of pinches of kosher salt over the mushrooms and toss to coat with the butter. Cook without stirring for about 3 minutes, or until the bottoms of the mushrooms are golden brown. Stir again and use a spoon to push the mushrooms out to the perimeter of the pan, creating an open space in the center of the pan. Add another third of the mushrooms along with another pinch of salt and cook without stirring for 2 minutes. Once again, move the mushrooms to the outer edge of the pan, creating a space in the center. Add the remaining mushrooms with another pinch of salt. Cook for 2 minutes without stirring. After 2 minutes, stir the contents of the pan thoroughly. Sauté the mushrooms for another 5 minutes, stirring frequently, or until the mushrooms are tender. If the liquid from the pan begins to evaporate before the mushrooms are tender, lower the heat to to medium. Pull the leaves from the remaining sprig of thyme and stir into the mushrooms. Serve hot. 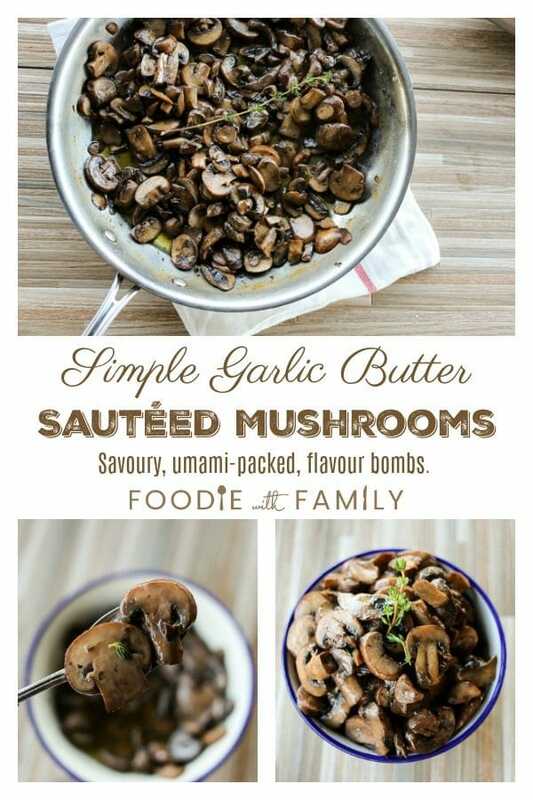 Love these Garlic Butter Sauteed Mushrooms? Try these! Hi, what is the music under the video, please? Thanks.